Monday’s broad market rout cannot be blamed exclusively on Apple (NASDAQ:AAPL) and chipmaker worries, with global growth (as well as the Fed) appearing to influence sentiment. That’s getting a boost this morning on reports that China’s Vice Premier Liu He and U.S. Treasury Secretary Steven Mnuchin spoke by phone for the first time in months about a possible deal that would ease trade tensions. Liu is also expected to visit the U.S. for talks ahead of a planned Trump-Xi meeting at the G20 summit on Nov. 30. 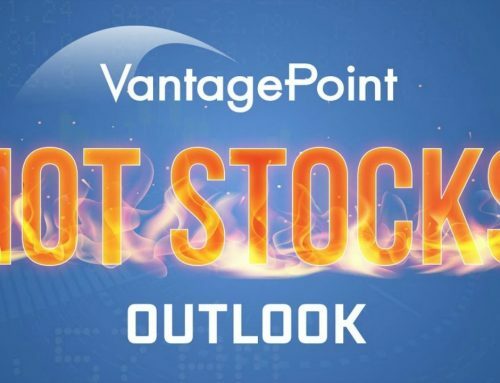 Using the predictive indicators embedded within the VantagePoint platform and its predictive AI technology, we will point out three significant things. We have a bearish crossover indicated by the blue predictive indicator line crossing below the black simple moving average on November 12th. We can combine that with the VantagePoint propriety neural index indicator moving from the GREEN to the RED position on November 9th. This indicator measures strength and weakness for a 48-hour period, in this case, weakness. The move to the RED position further makes the case for a potentially bearish scenario. We also have the predicted high and low below yesterday’s actual high and low indicating further weakness. I want to play the VP bearish indication. 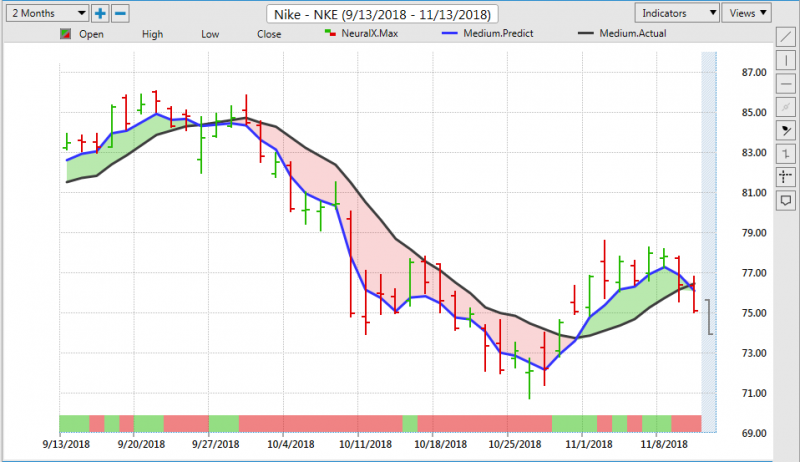 If you are strictly a stock trader, simply selling NKE in the $75.25 area is a prudent move. You are anticipating a move to the downside. It is always a good idea to enter a buy-stop order to mitigate potential losses. Placing that sell-stop in the $77.00 area will achieve that goal. Because of the reasons given above, the purchase of a debit put spread may be one way to approach this situation. You will first want to calculate your target strike. In order to do this, you will need three pieces of data. The current price, expiration date and the implied volatility associated with that expiration date. For NKE, that yields a targeted strike of ~$73.00. You may want to consider the NKE November 23rd weekly expiration 73/75 put spread, buying it for $0.50. The most you can lose is the premium paid and the most you can gain is the width of the spread less any premium paid. Max risk = $0.50 and max reward = $1.50. This means that you are getting odds of 3.00:1.